Quail is a small game bird that is part of the pheasant family. Originating in the Middle East, it has been farmed in the UK and Europe for hundreds of years. Favoured by chefs for its lean meat and sweet flavour, it is a healthy alternative to chicken. Quails are usually farmed and therefore they are available all year round. Look for birds with plump breasts and unblemished skin. They are not widely available in supermarkets, however, your local butcher should be able supply farmed birds. Make sure you buy from an ethical source. Quails can be kept covered in the fridge for up to 3 days after purchase. 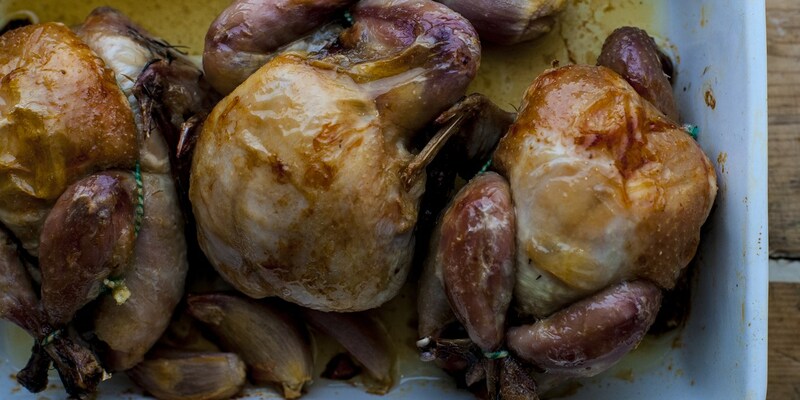 The easiest and most traditional way to cook quail is to simply roast them whole in the oven. You will need 1 bird per person. Quail is also great cooked on the barbecue. The Chinese deep-fry whole quails and eat the entire bird, including the bones! Quail legs are succulent and soft when cooked slowly in oil at a low temperature, a process known as confit. Quail breasts can be pan-fried, grilled or roasted; taking only a few minutes to cook, they are a great choice for a quick midweek dinner. The breasts, unlike chicken, can be served slightly pink in the middle. It is very unlikely that you will be able to buy quail breast and legs separately so follow our guidelines for jointing whole birds. Quail has a delicate, gamey flavour which should not be overpowered by very strong flavours, it lends itself well to light salads and spring vegetables. Martin Wishart roasts his quail and serves it simply with melted herb butter while Bruno Loubet stuff his quails and wraps them in pancetta for a more impressive meal. Mark Dodson serves Breast of quail with pea purée, pancetta and marjoram jus with a deep fried quail's egg to finish it off.